If you are an iRecruit customer and would like to submit a testimonial please do so here. We will contact you to validate your comments and confirm permission before posting them on our website. 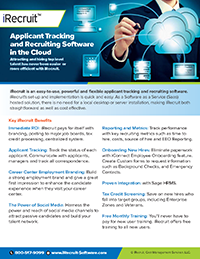 How long have you used iRecruit? How many users do you have (Admins, Recruiters, and/or Hiring Managers)? What do you like best about iRecruit? What do you like least about iRecruit? Would you recommend iRecruit to others? May we use your comments and logo on our website?